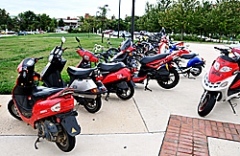 So everyone has to have seen the Maryland athletes zipping around campus on their sweet scooters. I mean I know I am always jealous when I am in a hurry trying to walk fast, but too tired to really pick up the pace and all a sudden a scooter rolls along by me, usually with two guys on it. I don’t know why there is so much guy-on-guy action on those scooters, but for some reason it is all the rage on campus, or is it just me? Anyhow, I digress. The scooters have actually led to many problems amongst their athlete owners. I mean who would’ve guessed that letting athletes drive around on a scooter without a helmet would lead to any problems? Unfortunately some of the consequences have been pretty dire. For instance, while riding on his scooter one Maryland football player Pete DeSouza was struck by a car. Another Maryland cornerback Dexter McDougle was involved in a single scooter accident where he broke his clavicle. These two accidents have led the newly instated Maryland football coach Randy Edsall to put a ban on the scooters for the upcoming 2011 season. Probably a smart move, but I do feel for the football players who never abused their scooter privileges and are being penalized. I'm always a little weirded out by these scooters. Have you ever asked an athlete about them or else hear them talk about them. Every athlete I've ever encountered makes it very clear that they DO NOT get them for free. One time I was talking about it with a friend in front of Tawes and these two burly athletes (football players, maybe?) overheard us from a sizable distance and practically ran over to make sure that my friend and I knew, for sure, that they don't get them for free. This, combined with the fact that every athlete delivers almost the same line verbatim makes me think there must be some kind of scooter-related cult going on, and these football players have definitely drunk the kool-aid. Excellent post!